If you’re looking for a simple, quiet and perhaps even romantic way to spend an evening, why not get out of the city for a while? Granbury is a quick and easy day trip from Fort Worth or anywhere in North Texas and has more to do than most cities its size. I recommend trying out a gallery night, held the last Saturday of every month. It’s a laidback way to see some great art, meet some interesting people and get to know this quaint little town. Granbury has all the things you’d expect from a small Texas town: a historic courthouse square with unique shops, some home-cooking restaurants you’ll enjoy and more. Plus, there’s the especially scenic lake right in the middle of town. But you may not know that the city has a small-but-determined visual arts community. This includes a real art gallery downtown as well as several other venues on and near the square that also display surprisingly high-quality artwork at affordable prices. Many people who visit art galleries never buy any art, and I suspect that’s the case with most of the visitors to Last Saturday Gallery Night & Art Walk in Granbury. Organized by The Galleries of Granbury, this even is similar to the twice-yearly gallery night events in Fort Worth, but Granbury’s event happens every month. Dora Lee Langdon Center, a historic home where art from a featured artist or group of artists is displayed. Meet the artist and learn more about the home too. Shanley House, a historic building that shares a parking lot with the library. Amateur artists are often on display, but check hours since this venue sometimes opens late. Uptown Arts, the backroom of a boutique called The Bridge. There’s art jammed into the room everywhere and a nice patio out back where you can get a breath of fresh air. Your Private Collection Art Gallery, a real gallery displaying works by professional artists. This is the hub of gallery night activity and perhaps where you want to start and end your evening. Other venues sometimes participate as well. Most venues offer refreshments including hor d’oeuvres, wine and beer, and many artists are present to meet you. A trolley can help you get from one venue to the next, but all within easy walking distance of each other. The details for each month’s event is available on the Galleries of Granbury Facebook page. To make a gallery night in Granbury a complete experience, you need to venture beyond the galleries a bit too. You can easily visit all the galleries on foot and see everything within an hour and a half. But I encourage you to take things a bit slower and to see what else in town might attract your attention. First, some other shops on the square may be open late for you to enjoy. You might also be interested in booking some tickets for the current show by the Granbury Theatre Company at the Granbury Opera House, also on the square. Several restaurants surround the square too. If you’re looking for familiar chain restaurants, most of those are out on Highway 377. The array of choices is larger than in most small towns. If you want dependable chain near the square, try Babe’s Chicken Dinner House or Fuzzy’s Taco Shop. Fuzzy’s is a great place to stop after you’re done with gallery night and grab a taco if you aren’t already full up. A great city park hides behind city hall and next to the Shanley House. Sunken below the road, you can step in and step away from your art walk experience to enjoy some time to yourself. A walking path will take you off into the sunset if that’s what you want. Lake Granbury is a long, narrow lake, so it seems to be everywhere you look in Granbury. There’s even a small public beach with boardwalk just off the square that you might enjoy. You can also book a room near downtown and stay the night. If you’re a foodie, Granbury’s huge H-E-B grocery store might be an attraction for you since most of us who live in or near Fort Worth don’t have access to this affordable chain that also offers gourmet choices. Whatever you decide to do in addition to visiting the galleries, make Last Saturday Gallery Night & Art Walk your reason for visiting Granbury. Then expand the experience into a completely fulfilling trip by exploring some of the other things to see and do in Granbury. 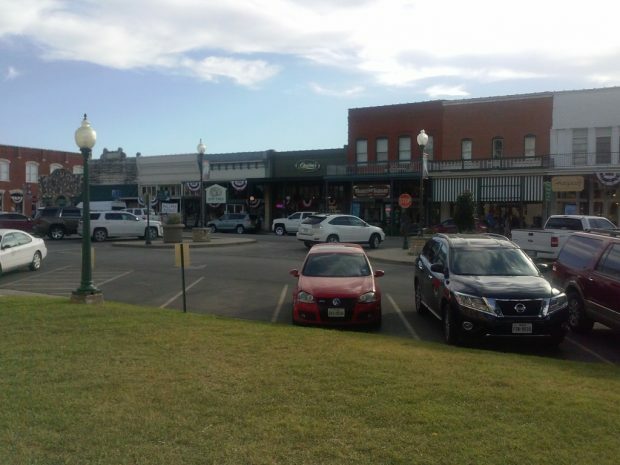 There’s plenty of free parking around the square in Granbury, and public restrooms are available too. I usually park at city hall and have never had to compete for parking. You can park around the courthouse or in another lot closer to the lake as well. Ignore what may appear to be rudeness and customer-unfriendliness at some of the shops around the square. You may see signs warning you about bringing your children inside some shops or indicating that the shops don’t have public restrooms. But enjoy these shops anyway if they happen to be open when you’re there. Most shopkeepers seem to be much friendlier than their signage indicates.